Item is picture of buildings including the Sudbury Public Library and four schools taken from behind a fence, cars, and a roadsign advertising "Carpark" with rates. 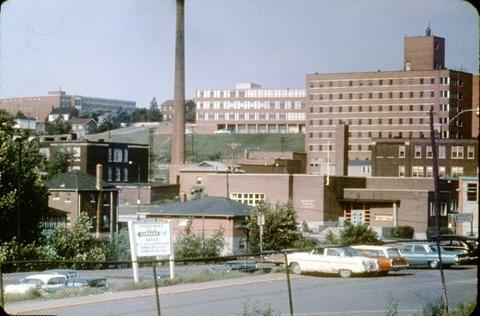 The schools shown on the hill from left to right are College Notre Dame at s s Levis, Mary Mount High School at 165 D'Youville Street, and St. Elizabeth School Of Nursing (nine floor building) at 30 Ste-Anne Road. On the left side of the library is St Aloysius at 164 Mackenzie Street and the Sudbury High School is accross the street at 154 College Street.